The use of high quality paper produces crisp, vivid images that are easily readable and longer lasting. Our top quality engineering rolls and sheets are straight and even for a quality print the first time. Available in case or bulk-bin quantities. 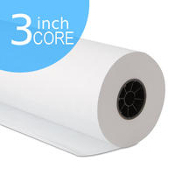 All rolls are produced on a 3” recycled, industrial strength core. If you need additional assistance please call us at 619-684-5241 We work for you!